Warner Bros. Entertainment announced that it will begin distributing movies for rent and for sale through Facebook. Advertising Age reports that its debut film will be “The Dark Knight,” which will be available to rent for $3 or 30 Facebook credits. Additional Warner Bros. movies will soon be available for rent and for purchase. Now, video providers like Netflix, Apple iTunes and Hulu are facing a new competitor and new challenges for movie rental business. According to comScore, Facebook was already the sixth-largest video provider in January, ahead of Microsoft, Hulu and Turner. The addition of movies is expected to accelerate that growth. Facebook is perfectly positioned to impact the industry since movies and TV are considered social experiences, and social connections are expected to play a larger role in the discovery of content. Now, Hulu and Apple’s iTunes are working hard to add social functionality to their services to keep up with the social evolution of movie-watching. 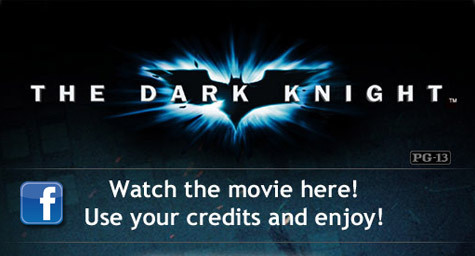 “The Dark Knight” is not a recent release and Facebook appears to be getting the same terms as iTunes, which rents the film for $2.99 and sells it for $9.99. Also like iTunes, Facebook takes a 30% cut of credits transactions. Now if Facebook lets studios sell their merchandise directly and set their own terms, its catalog is bound to grow very quickly, right along with its fan following.